Newsrooms must die! Long live newsrooms! Does a social enterprise hold promise for the future of newsrooms in Chicago? “Yes,” said Terry Mazany, President and Chief Executive Officer of The Chicago Community Trust. 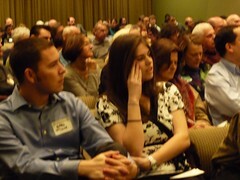 It was hard to hear Mazany over the din of 400 chattering reporters, editors, bloggers, photogs, commentators and independents from all sectors of Chicago’s newsgathering world present at the Chicago Journalism Townhall (CJTH) Sunday, Feb. 22, organized by perpetual do-gooder Ken Davis and his wife Linda. I am certain Mazany said “Yes” to the L3C idea because I caught him on tape, actually I recorded him in digital. But let’s not get lost in the analog vs. digital, paper vs. web, long-time pro vs. citizen journo, columnist vs. blogger, corner news box vs. click-through discussions that so-much dominated the conversation at the Townhall Sunday. Let’s just say Sunday’s gathering proved there’s reams of tactical knowledge to be exchanged, enough to forge a new cluster or two of media-savvy newsroom start-ups and connect the dots between the points until the Chicago region is a glorious virtuous circle of high-quality news and revenue streams. You can catch up on the sticky details articulated by writers and journalists far more informed and clever than I over at the CJTH blog. Me? I am excited about the Chicago newsroom of the future, a journalist’s dream come true that could rise from a floor of foundation cash and be sustained by a stream of revenue and profit. My theoretical newsroom, let’s call it The Times Democrat, would be a new kind of company, an L3C, or Low Profit Limited Liability Company. Mazany added currency to this idea when he said that Information has risen to the level of being a most pressing need for a community in our current democracy. More than ever, a newsroom must be a mission-based place. Mazany’s comments are useful for anyone thinking big about the newsroom of the future. He said that not only is our democracy at stake, but so is the Chicago region’s competitive advantage in a shifting world. To better understand this viewpoint read Richard Florida on the rise of the Creative Class. This conversation lifts the perspective up 10,000 feet and takes a shrewd look down. Let’s agree that journalism must live for the future of our democracy. Let’s also agree that the newsroom of The Times Democrat will be an amalgam of the best and most innovative practices we have online and in print, and that it will evolve to be something recognizable as newsgathering measured by a few key virtues. These include a culture of accountability and quality control that includes editors and fact checkers. And in fact, credibility and audience relevance will be the currency that moves the market of readers, or “news consumers,” from news org to news org locally and nationally. In this scenario, it’s likely everyone at the CJTH will get to play at The Times Democrat. Much revered will be those who have learned how to make money from the ads and play of the Web. But to get there, journalism needs one thing more than anything else to operate well: that thing is money, specifically re-birthing cash. That’s what our L3C newsroom, The Times Democrat, is about. So, what would the business model of The Times Democrat look like? It would simply be a modified Limited Liability Company that has the primary goal of serving a socially beneficial purpose and as such it could accept foundation money. Americans for Community Development, a coalition sponsored by our nation’s first L3C – L3C Advisors — says that the L3C is the for-profit with a nonprofit soul. The nonprofit soul of a newspaper arises from the recognition that newspapers are the only business specifically recognized in the U.S. Constitution and that the information they provide is vital to the proper function of a democracy. The Times Democrat L3C can operate as a business with a social purpose because its structure releases arcane IRS rules related to how foundations like The Chicago Community Trust, the John D. And Catherine T. MacArthur Foundation and the McCormick Foundation — all present at the CJTH Sunday — invest their considerable sums of money. Red tape be gone! When The Times Democrat presents its business plan [drawn together by the savviest business people, investors, journos and web innovators far and near to Chicago], foundations will find it that much easier to invest because of the L3C. A foundation like the Chicago Community Trust, having taken first position in the tranched investment, has also taken on most of the risk, making The Times Democrat a safer investment for others. Other investors like pension funds and private equity funds would more quickly follow suite. But you wouldn’t see venture capital firms. The returns aren’t fast enough or large enough, said Steve Miller of Chicago’s Origin Ventures. The Americans for Economic Development website says this: Because the foundations take the highest risk at little or no return, it essentially turns the venture capital model on its head and gives many social enterprises a low enough cost of capital that they are able to be self sustainable. “Self sustainable,” two of the most beautiful words in existence today. Not filthy rich, but instead, enough. And if filthy rich simply happens because The Times Democrat is great at meeting its mission, that’s OK, too. It can reinvest some profits to make the newspaper better. That means the newspaper L3c won’t have to ask its reporters to work for free or its editors to limit their earnings to $30,000 per year. Unfortunately, we heard a lot of this kind of hope-crushing talk at the CJTH Sunday. Obviously small newsrooms and no pay don’t sit well with Bernard Lunzer, president of The Newspaper Guild, which represents Chicago Sun-Times employees. “We will keep pushing the conversation,” Lunzer said. Lunzer has been visiting the Hill to forward Federal legislation related to the social purpose of newspapers and L3Cs. Draft legislation called the Program Related Investment Promotion Act of 2008 is being considered by staff in the Senate Finance committee, and is currently looking for sponsors. Here in Illinois, Bill SB 239 creating the L3C hybrid was introduced to the Illinois legislature Feb. 4 by Sen. Heather Steans (D-Chicago). I’ve not yet had an update on that. “The beauty of the L3C is its simplicity;” Lunzer said. “You accept that you will not have high profit but you will have some profit. And at some point [once a newsroom is recovering, it] could move back to a normal LLC. “For democracy to work, we need transparency in government. We need credible info and that has always started on the news side with print,” Lunzer said. Can a newsroom like the Sun-Times be reborn? “For the Sun-Times, what’s got to happen is you have to find a way to separate the product that is the Sun-Times from the debt that was incurred by business owners,” Lunzer said. That echoes something Mazany said at the CJTH. To be fair, organizer and moderator Ken Davis said it first, rather gruesomely. “Is there a point at which someone could wait until the Sun-Times (or the Tribune) either dies or can no longer survive, [and then] plucks out the beating heart of the newsroom and makes that a separate company, a new newsroom?” Davis asked. After some thought The Chicago Communty Trust’s Mazany answered in the affirmative. He rephrased it to me this way later. Could that happen despite the fact that the assets are not desks and chairs and buildings and paperclips, but instead intangible assets like institutional knowledge and people? So how can those of us who care help make that rebirth happen? The Newspaper Guild’s Lunzer has some ideas. “We need people to try and find real investment in the Sun-Times,” Lunzer said. “It will take community will and political will but that is what must happen,” he said. Lunzer said that all over the country, newsrooms are emerging in different forms. Certainly the L3C would allow foundation money to flow in, he said. But it’s just one of many ways including co-ops and ESOPs that The Guild is working with.